TomTom Navigator is the flexible and affordable in-car navigation system. Route planning, map reading and finding a way around difficult traffic conditions are all taken care of. Plus there are numerous features to make travel by car easier and safer. With TomTom Navigator 2 you'll always know where you are and how to get from A to B.
TomTom Navigator 2 has all the best elements of the highly successful first version, like uncluttered maps, easy-to-use controls, and crystal clear on-screen directions and verbal instructions. TomTom Navigator 2 couldn't be easier to use. Just enter your destination using the large finger-touch on-screen keyboard and your journey is planned door-to-door from your current location. TomTom Navigator 2 even finds a way around any obstacles you encounter en route, like traffic congestion or roadworks, so you're always on the right track! You can zoom in and out to see everything from a whole country or region to a single house number or road feature. That means a complete and reliable picture of your journey every inch of the way. TomTom Navigator 2 features the very latest digital maps from Tele Atlas. They're incredibly accurate. Yet despite containing more information than ever, they don't take up more memory thanks to the latest memory-saving techniques. 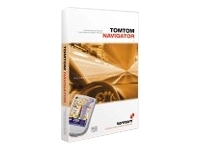 Wherever you are TomTom Navigator 2 gives you the knowledge on local points-of-interest. It also remembers your recent trips and all your important personal locations like home, work and that favorite picnic spot! This product is designed for Compaq iPAQ H5450.